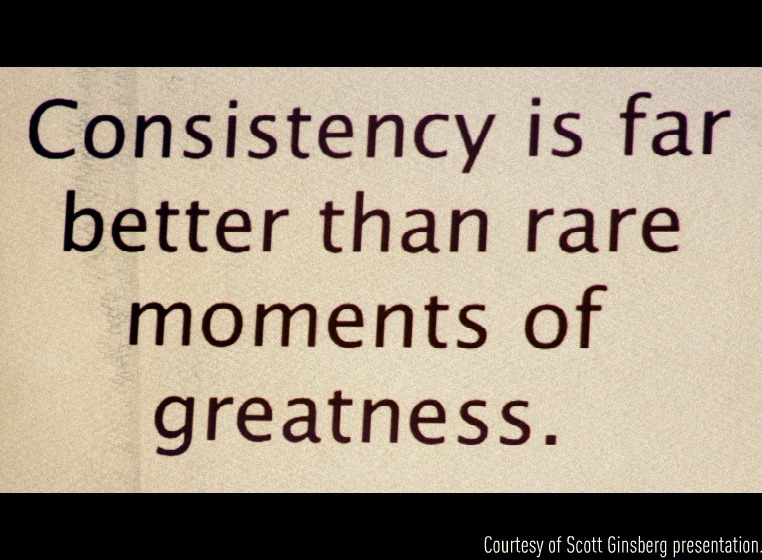 The Number One Rule of Fitness is Consistency. And that may be the hardest part. I posted on Facebook recently that when people think about exercising to make themselves more fit and able to serve others, rather than doing it just for themselves, that can really increase their consistency. Regardless, getting to the gym day-after-day takes drive, motivation, goals. People start out full of zeal and then life gets in the way. Accept it when it does, hopefully short-term, but don't let it get in the way long-term. Work, family, travel, illness. It can stump us all for a little while, but we can always get back on track. But there has to be something that pulls us back. You have to experience all the good a consistent exercise program can bring to your life to keep the train rolling along. When I was running a small marketing company, there was a period of time where I was so busy, and so excited and interested in the work I was doing for my marketing clients, that I left exercise for 9 months. My husband intervened. He said so much had changed about me without exercise ... how I moved, my moods, my energy, my enthusiasm, confidence. Back to gym ... the cheapest, quickest fix anyone could ask for (in my opinion). And we found a really good coach who helped me get on track and even inspired me to do this job (fitness coaching) full time. A lot going on in your life? Let your coach know to adjust the day's workout a bit. Have a mindset of your exercise time as a break from life -- you'll be thinking about the movements and lifts, so you won't have time to think about your to-do list. Put it on your calendar a week in advance -- plan ahead - your health comes first. If someone misses a week, I call them to see what's up. Insomnia? Zero in on why - working with a medical pro if needed - and this is when you SHOULD NOT exercise -- as you are at a higher risk of get injured if you are not rested. Have your coach give you some stretches and simple movements to do at home. Figure it out, make some lifestyle changes and then get back in the gym. Often exercise helps alleviate insomnia, but proceed with care exercising without proper rest. Motivation waning? Select an event to train for like an HKC or RKC, a cycling event, running event -- or any of the many obstacle races -- Ninja Run, Warrior Dash, Tough Mudder, Spartan Race, etc. Can only get there twice a week? That's okay. That's the minimum to keep you on track toward goals and preventing too much soreness. Once a week is not enough. Three or four days is even better and working up to that is fine. Life is a marathon, not a sprint. Can only go two days in a row? It's okay to train back-to-back with the right programming/coaching and supported by good food choices, rest and recovery strategies. Pain or Sports Injury? Don't let that be an excuse. See us for a Functional Movement Screen. You may need to see a medical professional or you might just need to get your body moving again. Work is too busy? Go light, but still get a workout in. You need it for stress relief. If you absolutely can't get there, let it go! No worries. Eat clean and try to keep all the other lifestyle factors in check so when you get back, it isn't so hard. Impatient for results? With us, you will see lots of encouraging results along the way to your end goals such as technique improvements, understanding of your body, lifting heavier, moving with more ease and grace, less soreness, more confidence in the gym and in other areas of your life. You'll see changes Day 1, but give it at least 3 months, and it really gets amazing after a year of consistent exercise. Not a morning person? Don't let that stop you from trying an early morning class. You may go in feeling less than optimal, but everyone comes out feeling good! I promise! If your schedule doesn't permit mornings, an evening class is a great option. Make sure you add in a small afternoon snack for energy -- it's a long time from noon until 5 p.m. We offer noon classes and 8:15 a.m. classes if your work schedule is more flexible. Not looking forward to your next trip to the gym? It might not be the right place for you ... that's okay, keep looking, there are plenty of options out there. Busy schedule, lots of traffic, hard to logistically get there? Pay close attention to how you feel after your training session ... happy, energized, content, nicely sore. That's what will get you there tomorrow. Explore other time slots for classes if you have flexibility or other routes to the gym to make the logistics easier. Studies show that the most consistent exercisers work or live within 12 minutes of their gym. Need a change? Get outside! Take a day and move in different ways in the park. Or take your kettlebells into the backyard. We mix it up at the gym with indoor, outdoor, MovNat, Nature Runs, Stretching class and more. Traveling? Ask your coach for some workouts to do at the hotel room, hotel gym or outdoors. If you are driving, take a kettlebell and go to it anywhere. Invite a friend or family member join you for accountability. Having a friend assist with accountability is an awesome idea for both of you! Identify the roadblocks preventing you from getting to the gym consistently and address them head on. Are you struggling to learn the movements? Are you always running late and feel rushed, stressed, embarrassed to walk in late? Do you feel too sore later? Not eating optimally and feel this process of getting healthy is futile? Talk to your coach -- these are all surmountable and a good coach wants to help you make exercise a consistent healthy habit and will work with you to find solutions. Find a coach who cares. The best part of life are the people in our lives. Finding someone you like, will keep you safe, challenge you, care about you as a person as well as a gym member, and who will go that extra mile when you need it. Smaller gyms build their business on having knowledgeable, people-oriented, caring coaches. The bottom line is this ... find a gym with a program that is fun and delivers results with coaches who care. That's what we strive to do at MoveStrong, so let me know if this is what you are looking for and how I can help.